Targeted Anti-Wrinkle Treatment is clinically proven to visibly reduce the depth and shadows of light to medium sized wrinkles, making skin's texture smoother and younger-looking. Includes natural ingredients proven to relax wrinkles with regular use. It's the topical alternative to injections! Anti-Wrinkle Treatment contains a combination of ingredients shown to reduce light and medium wrinkle depth an average of 34% (up to 63% in some cases) after 4 weeks of treatment. 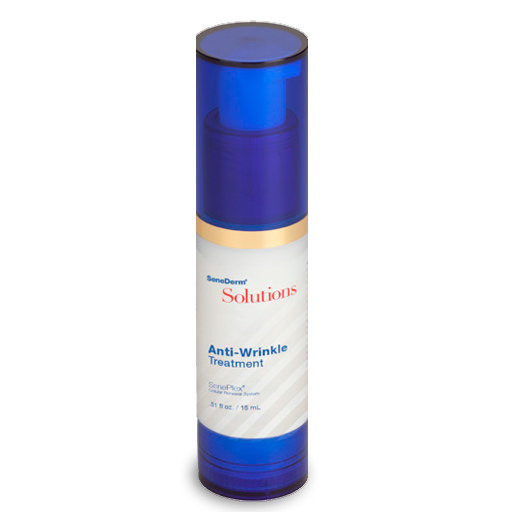 Anti-Wrinkle Treatment is formulated with a “Calming Complex” of peptides and unique, natural ingredients acting synergistically together to calm muscle action by easing the activity of certain innervating neurone, thereby significantly reducing the intensity of frown and wrinkle lines. Another natural ingredient causes relaxation of the muscle contraction in the area where Anti-Wrinkle Treatment is applied. Apply directly to light and medium wrinkles twice daily after cleansing and prior to application of any other SeneDerm® moisturizers. Anti-Wrinkle Calming Complex - Peptide complex that calms nerves and relaxes muscles. SenePlex Complex™ –Complex that increases cellular renewal. Butyrospermum Parkii (Shea Butter) - The scientific name for shea butter, considered as a plant lipid. Lipids are the oil and fat components of skin that prevent moisture evaporation from the skin and provide lubrication to the skin’s surface. Lipids are considered as a natural moisturizer. Camellia Sinensis Leaf - Protects collagen from being broken down.